Hodgson Russ grows as we attract people with new perspectives and new ideas. 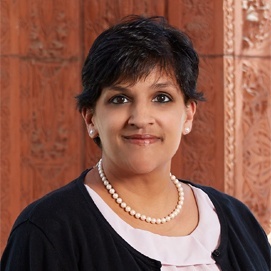 Sujata Yalamanchili heads Hodgson Russ’s Real Estate, Finance & Bankruptcy Practice Area. She handles commercial real estate transactions, such as leasing, purchase and sale matters, and a broad range of development projects. Sujata previously served as chair of the firm’s Committee on Attorney Recruiting, Diversity, and Development as well as a member of its board of directors. What do you contribute to the firm? I address my client’s needs and the firm’s needs in a variety of ways. First, I maintain an active practice, serving clients’ needs. I also administer the Real Estate, Finance & Bankruptcy Practice Area, which includes mentoring others at the firm. I help my co-workers tackle difficult problems, and I provide them opportunities to succeed. I believe that collaboration and mentoring are essential to success. Over the course of my career, I've handled many transactions, large and small, of which I am very proud. I am most proud of the transactions that will have a lasting impact on the community, such as assisting with the development of the Buffalo Niagara Medical Campus. I am also proud of the impact I’ve had on the firm’s strategic direction as a member of the firm’s board of directors and on the hiring, mentoring, and development of people throughout the firm. At Hodgson Russ, there is a strong emphasis on problem solving, producing excellent work product, and respecting others. We also continually strive to improve. As a consequence, we are open to new ideas. Hodgson Russ grows as we attract people with new perspectives and new ideas. It’s a quote from Maya Angelou: "I've learned that people will forget what you said, people will forget what you did, but people will never forget how you made them feel." I think this applies to the practice of law. What sets lawyers apart in the eyes of clients is not the law schools they attended or the grades they received; it is the results they achieve and the way they treat their clients and others. That is why I strive to distinguish myself as a results-oriented lawyer who treats people with respect.